Convolve a given image with an arbitrary image kernel. This filter operates by centering the flipped kernel at each pixel in the image and computing the inner product between pixel values in the image and pixel values in the kernel. The center of the kernel is defined as where is the index and is the size of the largest possible region of the kernel image. For kernels with odd sizes in all dimensions, this corresponds to the center pixel. If a dimension of the kernel image has an even size, then the center index of the kernel in that dimension will be the largest integral index that is less than the continuous index of the image center. The kernel can optionally be normalized to sum to 1 using NormalizeOn(). Normalization is off by default. This filter ignores the spacing, origin, and orientation of the kernel image and treats them as identical to those in the input image. Definition at line 65 of file itkConvolutionImageFilter.h. Definition at line 74 of file itkConvolutionImageFilter.h. Definition at line 85 of file itkConvolutionImageFilter.h. Definition at line 91 of file itkConvolutionImageFilter.h. Definition at line 88 of file itkConvolutionImageFilter.h. Definition at line 97 of file itkConvolutionImageFilter.h. Definition at line 94 of file itkConvolutionImageFilter.h. Definition at line 87 of file itkConvolutionImageFilter.h. Definition at line 93 of file itkConvolutionImageFilter.h. Definition at line 90 of file itkConvolutionImageFilter.h. Definition at line 99 of file itkConvolutionImageFilter.h. Definition at line 96 of file itkConvolutionImageFilter.h. Definition at line 86 of file itkConvolutionImageFilter.h. Definition at line 92 of file itkConvolutionImageFilter.h. Definition at line 89 of file itkConvolutionImageFilter.h. Definition at line 98 of file itkConvolutionImageFilter.h. Definition at line 95 of file itkConvolutionImageFilter.h. Definition at line 73 of file itkConvolutionImageFilter.h. Definition at line 71 of file itkConvolutionImageFilter.h. Definition at line 72 of file itkConvolutionImageFilter.h. This filter uses a minipipeline to compute the output. ConvolutionImageFilter needs the entire image kernel, which in general is going to be a different size then the output requested region. As such, this filter needs to provide an implementation for GenerateInputRequestedRegion() in order to inform the pipeline execution model. The kernel needs padding if any of the sizes of its dimensions is even. This method checks for this condition. Calculates the padding width needed to make each dimension odd. Calculates the radius of the kernel. 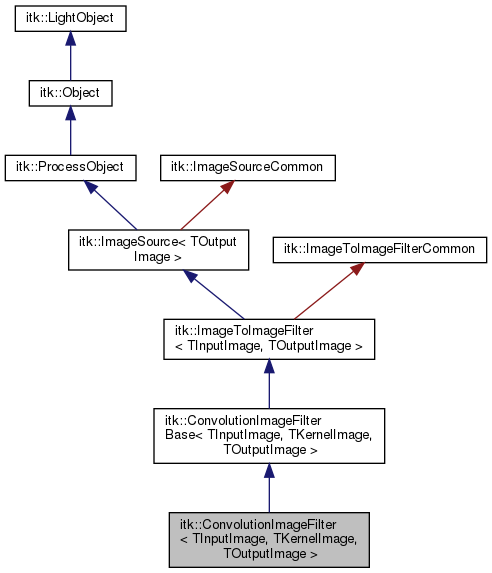 Reimplemented from itk::ConvolutionImageFilterBase< TInputImage, TKernelImage, TOutputImage >. Dimensionality of input and output data is assumed to be the same. Definition at line 83 of file itkConvolutionImageFilter.h.